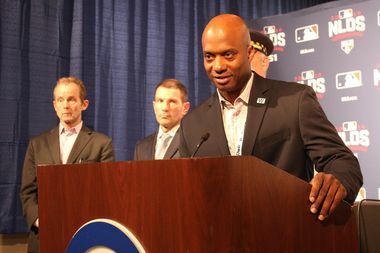 Julian Green, Cubs vice president of communications and community affairs, said that postseason tickets should be treated like cash and will not be replaced if lost or stolen. WRIGLEY FIELD — Don't bother calling the Chicago Cubs if you lose your postseason tickets — they won't be replacing them. While the policy is in line with the regular season, the club is reiterating warnings of counterfeiting, secondhand sellers and the perils of posting the "extremely valuable" tickets on social media ahead of the playoffs. Photos shared on Twitter or Facebook with the ticket bar codes, seating numbers or other markings make it easier for counterfeiters to print up fake tickets, said Julian Green, Cubs vice president of communication and community affairs. If fans' tickets are compromised because of careless social media posting, they're out of luck, Green said. "It's detrimental to your investment," Green said. "These are extremely valuable tickets, and they should be treated like cash." The warnings come one day before the Cubs kick off the National League Division Series Friday night against the San Francisco Giants at Wrigley Field. Tickets to the games are expected to be the most expensive in the history of baseball, according to Ticket IQ, with potential Game 5 tickets reselling for nearly $1,000. Both Green and Chicago police said unauthorized resale of tickets should be avoided, particularly from unverified listings like those on Craigslist or people selling them on the streets around Wrigley Field. "It's difficult, because they've gotten very good at their trade," said Area North Deputy Chief Al Nagode of counterfeiters. "Some of these tickets are extremely close to the real thing. Basically, if it's too good to be true, don't buy it." Police will be on the lookout for fake tickets and will investigate any cases they come across during playoffs, Nagode said. There's "no reason" to buy tickets from sellers on the street, Nagode said. Instead, it's best to buy tickets directly from the Cubs or the team's authorized resale site, Stubhub, officials said. While officials don't want to "give counterfeiters the playbook" of mistakes made on fake tickets, Green said real ones will have a hard-to-replicate watermark and the MLB logo. Last year, Green said the Cubs confiscated several hundred counterfeit tickets during the nine-game postseason. Green also had a warning for businesses looking to capitalize on the Cubs' success with promotions or merchandise. "Consider working with us first," Green said. "It is the best and safest way to ensure a company isn't infringing on our marks, our logos, our name or our likeness." The advisement does not come lightly; last month, the Cubs joined Major League Baseball in a federal lawsuit against three dozen street and online vendors for counterfeit merchandise.